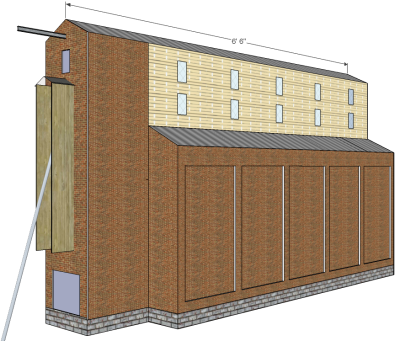 Plan-Sets offered to construct a Grain Elevator Complex. 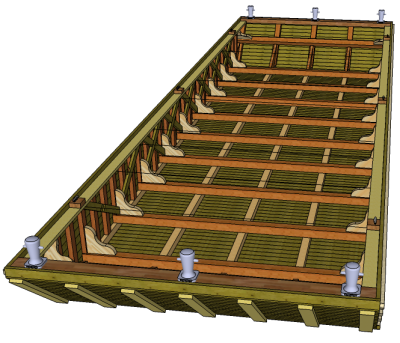 Your source of Grain Elevator structures. Grain Elevators provide a reason for a train stop with animation of a filling spout filling grain cars as the train indexes filling rail car after rail car. Farm Town Grain Elevator​​ •••• Such Grain Elevators were found throughout all the farming areas in North America next to railroad tracks. They were known as Prairie Skyscraper's because they were taller than any other structure on Americas' Great Plains. 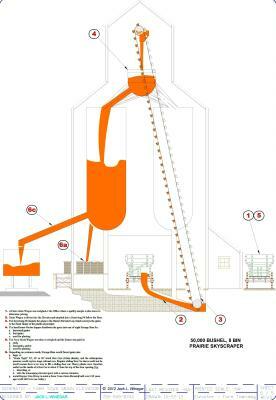 Farmer Co-Ops used these elevators to pool their grains for better pricing from the grain buyers. Grain buyers were notorious for undercutting individual farmers. Footprint 20¾ʺ x 15½ʺ. 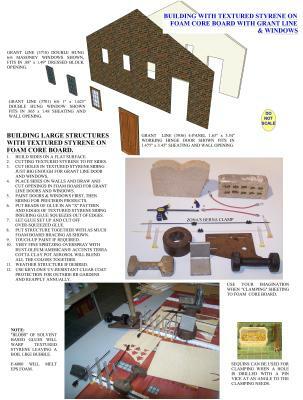 $11 Plan-Set includes: 5) 13" x 19" super B drawings with an indoor and Railroad Garden material list of Foam Core Board and an operation schematic. 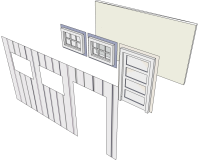 Examples of 3-D renderings included in these Plan-Sets. "A+ All The Way Favorable!!!!!!!!!!!!!!!!!!" feedback by Mr. '67 Chevelle . Prarie Skyscraper SUPER EXTRA Booklet​​ •••• This 22) page booklet covers the construction of a Grain Elevator which could be found by the thousands on the great plains of North American 100 years ago. 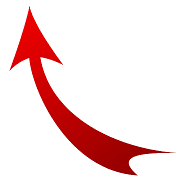 Footprint 20¾ʺ x 15½ʺ. 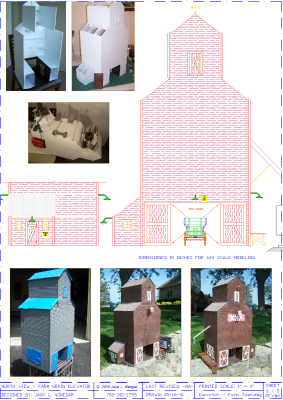 $19 Plan-Sets includes: 16) 13" x 19" super B drawings with an indoor and Railroad Garden material list of Foam Core Board and an operation schematic of a Grain Elevator, and a Flair-Type, Grain-Tight Farm Wagon. Spiral Bound Booklet consists of: 22) 9½ʺ x 13ʺ pages which include 3-D renderings, adhesives, 19) construction and finishing and vintage photos, painting, UV stabilization and weathering instructions. 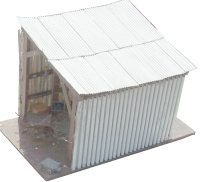 5 Grain Elevator Companion Structures​​ •••• The above 5) companion structures could be found with any Grain Elevator operation. 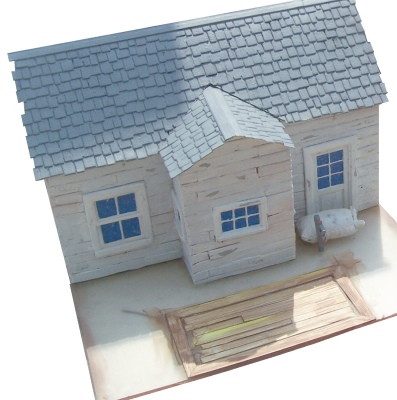 $50 Plan-Sets includes: 20) 13" x 19" super B drawings with an indoor and Railroad Garden material list of Foam Core Board for a, Scale House, Closed Storage Shed, Open Shed and a Flair-Type, Grain-Tight Farm Wagon and Open Barge. 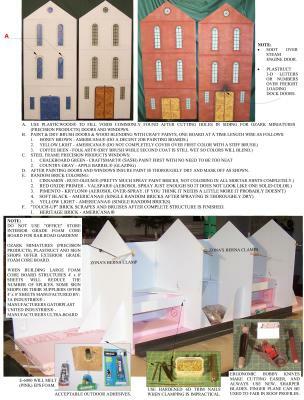 $12 Plan-Set includes: 6) 13" x 19" super B drawings with an indoor and Railroad Garden material list of Foam Core Board. $6 Plan Sheet includes: 1) 13" x 19" super B drawings with the recommend material in styrene. 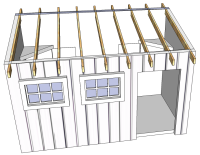 Closed Storage Out Shed​​ •••• A very simple first project in any scale. Footprint 8ʺ x 4ʺ​. $8 Plan Sheet includes: 1) 13" x 19" super B drawings with the recommend material for indoor or outdoor railroad gardens and instructions. 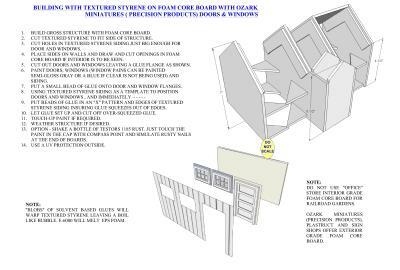 $12 Plan-Set includes: 2) 13" x 19" super B drawings with an indoor and Railroad Garden material list of Foam Core Board. 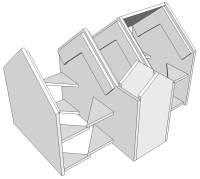 Flare-Type, Grain-Tight American Farm Wagon​​ •••• The “Flare-Type” Wagon is a variation of the boxes found on Farm Wagons across the North American Continent. 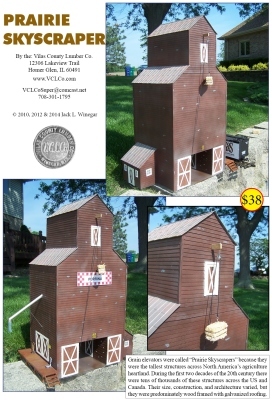 This type of box became popular as the use of mechanical corn pickers became available. 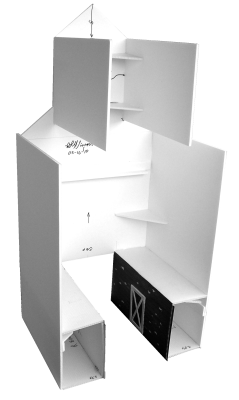 $20 Plan-Set includes: 11) 13" x 19" super B drawings with all details shown full scale to be used as templates, material list with Wheel Fixture drawings. Spiral Bound Booklet ​c onsists of: 14) 9½ʺ x 13ʺ pages with all details shown full scale to be used as templates, material list and Wheel Fixture drawings. 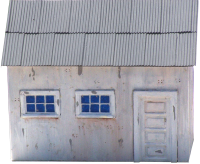 Urban Grain Elevator Complex​​ •••• Includes; Closed Storage Shed, Scale House, Open Ended Shed, Buildings, plus Grain-Tight Farm Wagons with an Open Barge. $12 Plan Sheet includes: 1) 13" x 19" super B drawing. 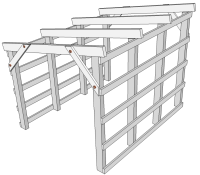 Click to view list of Flair-Type Grain-Type American Farm Wagon Plan-Set details.